Patron saint and intercessory devotional and prayer candles are beautiful reminders of our enduring faith in God’s love, as well as his care and concern for our needs. Dadant Candle free-standing, patron saint and intercessory devotional and prayer candles are clean-burning, convenient to use, and are perfect to enhance your devotional area, recognize your church's patron saint or celebrate feast days. 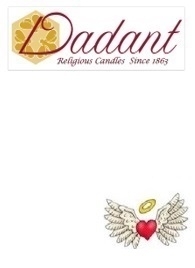 Use Angel Direct’s “Shop By” filters on left side to easily shop for Dadant Candle devotional and prayer candles by patron saint or intercessory name, burn time, candle top and price. AD Heavenly ValueTM – Before placing your order, use Angel Direct’s shipping estimator (add product to cart, then select “View All”) to see our unbeatable UPS Ground shipping rates on all patron saint candle products.